Mode Junkie: Combat boots = Me for FALL! as i was checking lulu´s blog at chictopia, she posted these pictures from emma cook runway collection AW. i am soo into this whole doc martens, combat boots trend but i don´t really know how they´d look on me. 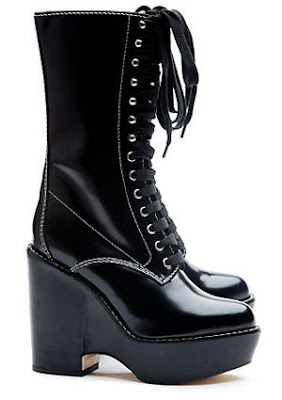 nevertheless, there´s no stoppin me from ordering these craaazzyy white patent combat heeled boots at mango online. i have so much on my mind right now on how i´m gonna rock it after miguel comes out. I AM SUCH A COOL MOM. haha! don´t they remind you of these tall doc booties from Chloe? crazy right? but not as crazy as the red ones lulu and rumi are rocking. i am not yet rock star enough to don those. here´s our girl Nicole wearing the legit ones. but for now, i would just have to keep on wearing them flip flops because i am getting heavier each second and wearing heels feel like wearing shoes with a bed of nails inside it. ohh yes i´ve tried! ahh you are going to be the coolest mother! i reallyy like those doc-marten like boots... i think i actually like them more than the real ones! so good for you for finding them. The white Doc. heels actually appeal to my shoe senses. It'd be so hard to combine with other pieces though. And you look cute as ever. the first shoe is definitely not for everyone to wear... the second pump is absolutely lovely. I love the edginess of the Doc Martens but I personally am not brave enough for them:( Cannot wait to see the coolest mum around rock them like there's no tomorrow! And how can you always look so fresh? You seriously make pregnancy chic! I will love to owe the red chloe docs that lulu owns! how fab! yummy mummy.very cute. Loooove those white boots, they are amazing!! Haha totally love the Nine West versions, good find :) And you definately are going to be the most stylish mummy around! I linked you back, I can't believe I hadn't done it ages ago!!! Ah you look so lovely! Great sunglasses! but I don't dig much the heeled versions.